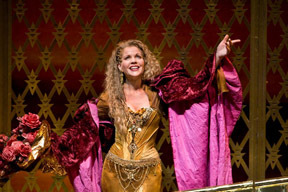 Renee Fleming in the Met�s Thais. A giant in his lifetime, the French composer Jules Massenet suffered a severe dwindling of his reputation in the decades following his death in 1912. The suave, sweet richness of his music was way out of step with 20th-century modernism, and the chintzy exoticism of his opera settings (Hungary! India! Spain!) was deemed politically incorrect. Now, though, his music is receiving renewed attention. Beneath all the layers of tinsel, his operas feature vocal lines that are so impeccably crafted that they can make even mediocre singers sound really good. The Metropolitan Opera�s broadcast of his Tha�s features singers who are much better than mediocre. Thomas Hampson plays the miserable self-loathing 4th-century cenobite monk Athana�l, and Ren�e Fleming plays the title character, a Roman courtesan in Egypt whom he tries to convert to Christianity. The stage work is best known for its �Meditation� for solo violin, which many violinists have used as a recital piece. When the opera premiered in 1894, it was also known for the conveniently timed wardrobe malfunction that happened to the American soprano Sibyl Sanderson on opening night, resulting in a full unobstructed view of her breasts for the crowd at the Paris Opera. This is a live broadcast � something similar could happen here. Tha�s screens at 11am Sat at various local movie theaters; check Calendar for locations. Tickets are $15-24. Call 213-639-6166.